ATEC Electric Inc. is a locally-owned business that is dedicated to providing top-quality work for all your electrical needs. We take pride in what we do and always strive for quality control. 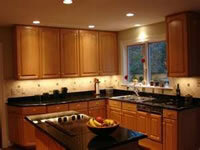 Our goal is to provide our customers with the highest quality installation and service possible at a fair price. To not only become your first choice when electrical work is needed, but also become your trusted consultant and advisor. ATEC Electric Inc. will replace or repair the materials at no cost to the customer in the event the installation becomes faulty within one year from the date of installation, excluding abuse, negligence, or consumption (such as light bulbs). Copyright © 2011 • www.atecelectricinc.com • All Rights Reserved.